A TRIPLE LP AND DOUBLE CD OF INTERPLANETARY PERFECTION! A stunning live Sun Ra event, recorded at the Inter-Media Arts Center in New York, April 20, 1991! 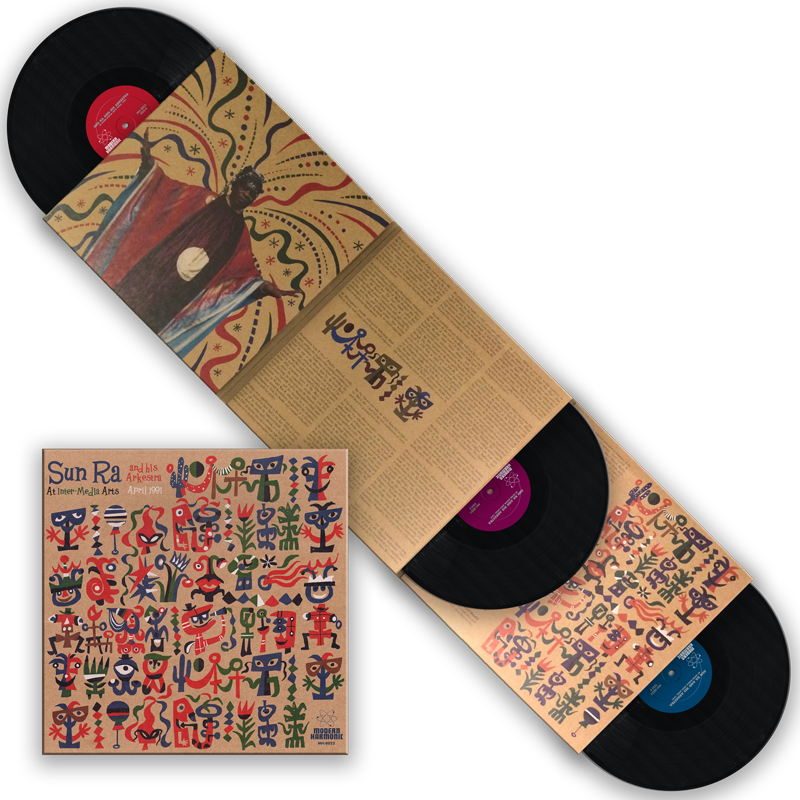 Modern Harmonic proudly presents this very special Sun Ra recording, issued here for the first time ever! This concert was just two years before Ra?s ?earthly departure? ? and his keyboard work was amazingly strident and vibrant here. The Arkestra was in perfect form as well; this special night also showcased the Arkestra?s vocal magnificence with selections and sections powerfully performed by June Tyson, Michael Ray, T.C. Carney, James Jacson, and John Gilmore. Rarely will you hear the Arkestra with such clarity! Many Sun Ra releases were derived from live performances, but seldom did they have the quality or sonic-punch of this recording. We?d like to extend a big thank you to the folks at radio station WNYC, for perfectly capturing this event. At Modern Harmonic, we?re celebrating this evening by releasing the complete performance across three premium RTI LP pressings ? or on two compact discs ? with both configurations packaged in stunning, tri-fold chipboard jackets. Our limited edition release also features extensive liners by noted jazz writer Howard Mandel, and is wrapped in a gorgeous design by legendary album-art icon, Jim Flora. Triple LP pressed on HQ RTI vinyl with extensive liners! Check out the review on The Village Voice! Also available as a 2-CD set!